The Original Barrel Barbecue or is it barrel bbq or even barrel barbeque, whatever you call them. 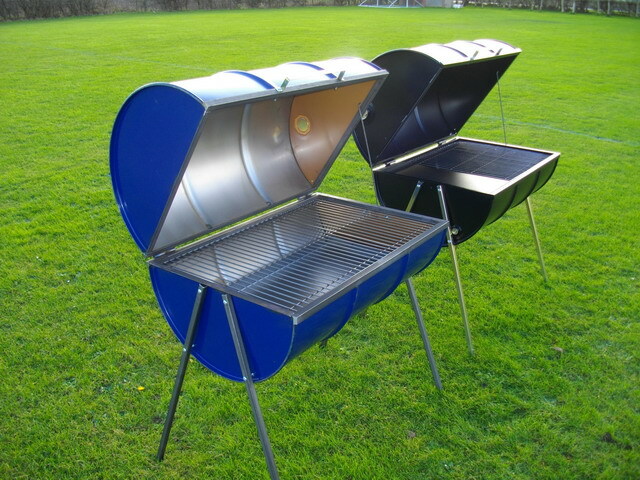 Our Barrel Barbecues have an extra large grilling capacity, ideal for those large family gatherings, easily catering for 30 guests and are supplied with a lid to enable cooking in the British weather. The Original Barrel Barbecue is constructed from a recycled 45 gal oil barrel similar to a bri, then bolted to substantial box section legs, these strong steel legs are made detachable to aid transporting and storage. Our Barrel Barbecue is very robust and stable, a major consideration, you don't want to spend an hour cooking your favorite food just to see being eaten by the dog when the barby tips over ! !.The 14 gauge steel charcoal / ash pan is fitted to prevent the hot charcoal touching the barrel and controls the air supply thus regulating the heat and cooking times, heavy 4mm diameter bars on our grill, retain heat and give char grill marks on food especially jerk chicken, the heavy steel hot plate can be used for fish, eggs, burgers etc. The lid cuts down on smoke, speeds the cooking of joints & chicken via indirect heat, similar to an oven in your kitchen and permits use in inclement weather. 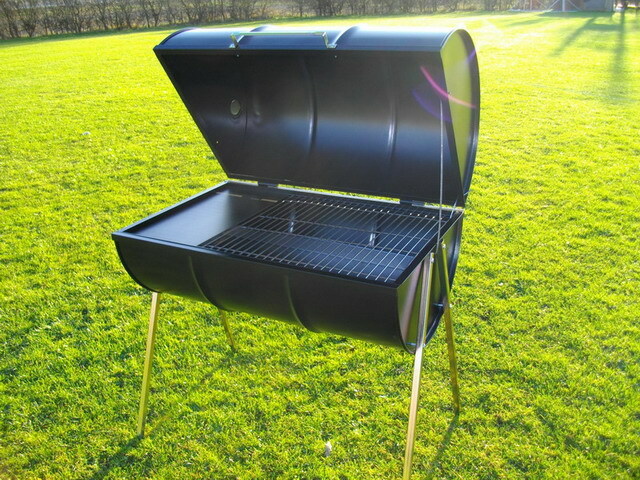 The main difference between The Original Barrel Barbecue and Deluxe Barrel Barbecue the deluxe bbbq utilizes a new oil drum powder coated black and the original bbbq utilizes a selected used oil drum, colours vary and the steelwork is not coated. Normal delivery approximately. two working days if using direct bank transfer but it does depend on demand. Please don't leave ordering until the sun comes out, because every man and his dog has the same idea. As seen in the Telegraph Magazine 11th Aug. There are many different types of barbecue on the market, there's no hard and fast rules but if you choose on of our Original Barrel Barbecues or for the more decerning our Deluxe Barrel Barbecue you'll be happy with your choce. Whichever one you choose, keep safety in mind. 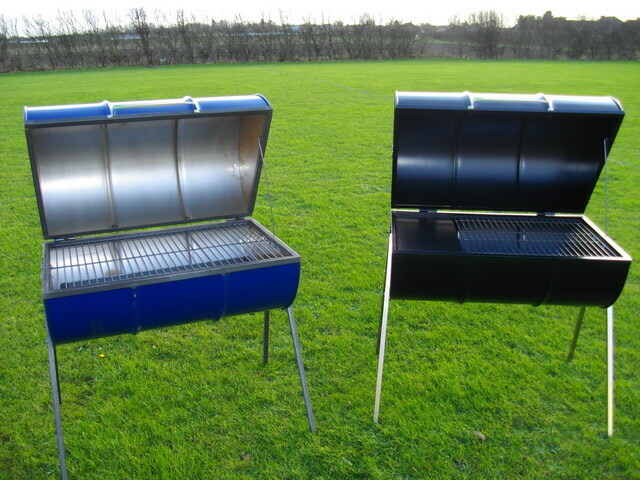 Make sure your barbecue is sturdy, our Barrel Barbecues are, as barbecues become deceptively hot and many cheaper models are extremely unstable. Look for a barbecue with a fat collector to minimize smoke emissions and potential fire risk. Site your barrel barbecue well away from fences and trees. Ensure the site is level and not situated in a position where your barrel barbecue can be knocked over. Always use the correct materials and fuels for lighting the barrel barbecue and observe the manufacturer's instructions (avoid using barbecue lighter fluid in your Barrel Barbecue. Look for childproof caps when buying lighter fuel and always replace the cap after use. Never pour lighter fuel onto hot coals even if they appear to have gone out. Keep combustible materials and matches away from the barrel barbecue. Keep all utensils and plates for cooked foods separate from those used for uncooked food. All frozen food must be completely defrosted before cooking on a barbecue. Meat and other high risk foods should be kept in a refrigerator until needed. Barbecues tend to char food on the outside and leave the centre raw. All meat should be cooked thoroughly but portions of chicken and other poultry need particular care. It may be a good idea to pre-cook meats by conventional methods before finishing off on the barbecue. Food should not be left in the sunshine. To prevent contamination by insect pests, all food should be placed in sealed containers and be kept off the ground. Only kettle-style or barrel barbecues are suitable for cooking joints and whole chickens. Other types will not cook the meat thoroughly. Use a meat thermometer to check that the meat is cooked properly.